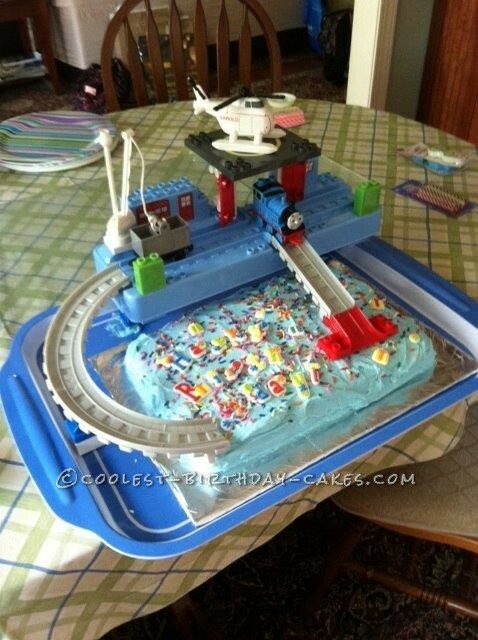 My grandson wanted a themed celebration for his third birthday and was obsessed with Thomas the Tank. As a recently retired teacher who took the Wilton cake decorating course at our local craft store, I volunteered to make the cake (before I knew the theme) and when I found out about Thomas I racked my brain for how to best design the cake. I did some research on-line but nothing really was inspiring me until the day I went to buy him some presents and came across a wonderful Duplo set that I thought he would love because it was all about Thomas. The minute I saw it, I knew I wanted to build the cake around the gift. Once I had that idea and a guest list (so I knew how many people the cake needed to feed) I set about planning my approach which evolved into an 11X14 sheet cake with the classic Thomas blue color for the frosting, and I arranged it so that the tracks and Thomas himself were the central decorations on and around the cake. The photo shows how it worked out, and everyone was pretty happy with that cake (and later with the Duplo set). The biggest challenge with the cake was being able to put it together ahead of time when he wasn’t around to “catch” me, and then to move it without it coming undone as it went from the basement where I stored it out of sight to the patio for the party. My solution was to use a very large tray which I found in the same shade of blue I was using, and I daresay it was a great solution since I have used the same tray for a couple of other sheet cake projects.